December 2016 is a rare "double" BYO issue for my writing, including a feature on hoppy sours that is available on their website for free! The Advanced Brewing article digs into the pitfalls and mitigation strategies for fermenting with brewer’s yeast after kettle souring or sour mashing. You’ll have to read the article for all of the science and suggestions, but I wanted to relate the experiment I performed for it. My BYO articles usually aren't repeated here, but one of the rows of the results was omitted during editing, so I wanted to make it available. A couple months ago I brewed 10 gallons of wort that fell somewhere between schwarzbier, dunkel, and bock (92% Weyermann Floor-Malted Bohemian Dark, 4% Weyermann CaraMunich II, and 4% Briess Blackprinz mashed at 158F to 1.058). I fermented half with 34/70 slurry harvested from my first LoDO Pilsner in an attempt to create a schwarzdunkelbock. The result was wonderfully bready-malty with a smooth chocolate-roast. It was so good in fact that I didn’t get around to taking formal tasting notes before it kicked… conversely I recently dumped the last couple gallons of that Pilsner. I took the remaining 4.5 gallons of wort and split it nine-ways. The first three were left as is, with a typical post-boil pH of 5.10. I then added 88% lactic acid to the remainder to reach 3.54, a typical pH for a tart gose. After running out three more, I continued to add lactic acid to lower the remaining 1.5 gallons to a tongue-assaulting pH of 2.99 (close to as sour as any beer). I took one of each acidity trio and pitched WLP001 California Ale, WLP007 Dry English Ale, and WLP566 Belgian Saison II. For each jug I added 2 tsp of slurry directly from fresh White Labs pouches. This is a considerable over-pitch for .5 gallon, but I wanted to give each yeast their best chance without starters or pH acclimatization. I took gravity readings along the way to judge how rapidly the yeast were attenuating. As you can see, for the most part, regardless of the strain the lower the pH the slower fermentation progressed. The final gravities were also affected by the high acidity. Dosing with lactic acid isn’t a preferred method for making sour beer (as you can see from the tasting notes), but clearly some strains performed better than others. Hopefully this provides a few data points for those looking to produce sour beers quickly. I often follow quick souring with a 100% Brettanomyces fermentation, as it tends to be better suited to low-pH fermentations and add some of those lacking notes of interest. 2017’s BYO Advanced Brewing topics including spunding valves, how mineral profiles change with brewing, and LoDO lagers! If you want to subscribe for all of that, use this link and I get a nice kickback. Thanks to all of those who have already subscribed. Quick question on your BYO hoppy sour beers article - do you get off / vegetal flavors from leaving your hops in the keg? I had always thought that leaving in them in for weeks would make the beer taste off with time, but never actually tried it. I've never had issues with grassy flavors developing from long-term keg hopping. I prefer whole hops, with the idea that less of the cells are broken open, but I've used blends of whole and pellet without issue! Hi Mike! Keep up the great work. 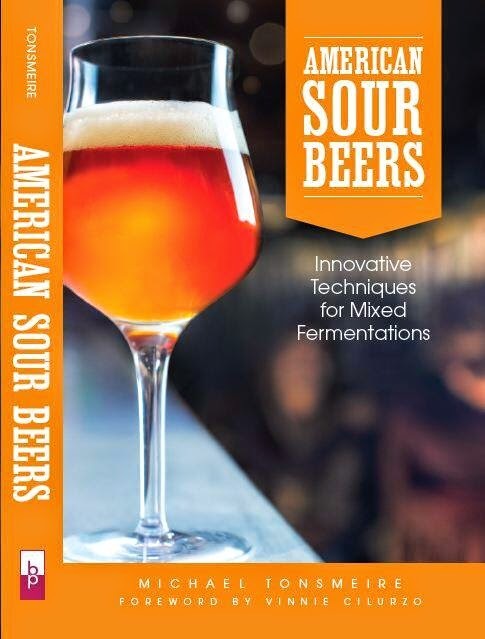 Love the book!...No surprise that quick souring has been a big topic lately. Sour beers are awesome and who wouldn't want to get them ready to enjoy more quickly? I've been learning about the GAR gene function of saccharomyces, especially how it can be affected by proximity to pediococcus. It seems like this relationship might help us understand why it is difficult for 'quick sour' methods to achieve the complex flavor profile of a well-aged mixed fermentation beer. To me, it also seems like a compelling argument for having pedio in the mix for primary fermentation. I'd be curious to hear your thoughts..
34/70, to go from 1.058 to 1.012 (mashing at 158). Really close. 23 IBUs, 1 oz (in 12 gallons) of Saaz at 10 minutes. Munich I is the closest bet, it's just a slightly richer maltiness (if anything I'd add 10% Munich II). It'll be a great beer, just not exactly the same! Likely won't get quite that dry.